After looking for ideas for a new animated movie, Disney story-man Joe Grant eventually decided to base a story on his springer spaniel named Lady. While Walt Disney liked the idea for the movie, he felt that the movie needed something more to counter the inherent sweetness of Lady's story and hit upon combining Grant’s idea with a short story written by Ward Greene called, “Happy Dan, The Whistling Dog,” which featured a happy-go-lucky dog that he felt would fit the bill perfectly. Walt bought the rights to the story and merged the two which resulted in the beloved Lady and the Tramp. The movie opens on Christmas morning and a young man named Jim Dear his wife a cocker spaniel puppy that they end up calling Lady. We watch the young puppy grow up and be spoiled in her plush surroundings that make up the Dear family household. One special morning, Lady is finally given a dog license, which to dogs is a badge of honor, and Lady is quick to find her friends in the neighborhood to share the news. Two of her closest friends that live nearby include a Scottish terrier named Jock and an old bloodhound who may or may not have lost his sense of smell named Trusty. Not everyone is as fortunate as Lady, as a mutt named Tramp has no license or a home, but that doesn’t bother him in the slightest. He loves the freedom of his life with no rules, no house, and no responsibilities to tie him down. He doesn’t even have to go hungry since there’s plenty of local restaurants nearby including his favorite – Tony’s that is always happy to give the friendly dog a meal. The Tramp is also the main target of the neighborhood dogcatcher but he’s too smart to get caught. Unfortunately, some other dogs including a Lhasa Apso named Peg and an English bulldog named appropriately Bull, aren’t as clever as the Tramp and they are captured. They know that the Tramp will save them and sure enough he does, which only raises the ire of the already furious dogcatcher. Life is good for Lady until the Dear family welcomes a new baby into the house. No longer the focus of their attention, Lady is saddened at her change of fortune and is consoled by her friends. The Tramp however doesn’t share their optimistic appraisal of the situation and tells her that it’s the beginning of the end for her and that she might as well prepare for a life outside in a doghouse. The Tramp is so different from Lady that she can’t help but be interested in him much like a certain princess who fell in love with a smuggler in a galaxy far far away. When the Dears go on a trip, they have Aunt Sarah come to watch over the baby and Lady. They don’t realize that Aunt Sarah doesn’t like dogs and to make matters worse, her two Siamese cats cause trouble and make Lady look like the guily one. When Sarah puts a muzzle on Lady that’s the last straw and Lady runs away only to be chased by some dogs. 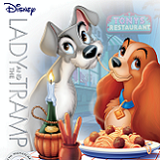 The Tramp comes to her rescue and helps her get free of the muzzle and shows Lady what his life is like “footloose and collar free.” Their day ends with a romantic candle-lit spaghetti dinner at Tony’s complete with music and singing. The next day the Tramp chases some chickens and during their escape Lady is captured by the dogcatcher and taken to the pound. While there, the other dogs let her know that her license will allow her to leave and proceed to tell her stories about the Tramp’s background which only causes him trouble when she later confronts him about his past girlfriends and his failure to rescue her. Now chained in the back yard by Aunt Sarah, Lady spot a rat making its way into the baby’s room and barks for help. The Tramp hears her barking and returns to try to save the baby from the malicious rat and to try to win back Lady’s love. From there, there’s some more misunderstandings, acts of bravery, and of course a happy ending but I won’t say more than that. Lady and the Tramp is a great Disney movie, but it’s also a great movie period. The movie is filled with fun and interesting characters, a lot of great songs by Peggy Lee, and some very nice atmosphere. I may be somewhat biased since I’ve owned two cocker spaniels that looked a lot like Lady, but I would still consider the movie to be a classic all on its own. The story of two lovers from opposing sides of the tracks has been told many times and when done right can always be entertaining and this is one of those times. Another bonus to the movie is that it was filmed in CinemaScope which looks great today on our wide-screen tvs. This is the kind of movie that Walt Disney excelled at making and even though the movie was interrupted by World War II and shelved for awhile, you couldn’t tell by looking at the film. This is another Disney classic that should be in every-one’s home! Like their other Walt Disney Signature Editions, Disney has done another stellar job restoring this movie that I will wager looks better here than it did when it was first released. This 1080p (2.55:1) transfer looks so good that you will think that the movie is a brand new Disney film rather than being a fifty-seven year old film! Colors pop off the screen, there’s an abundance of detail present, and the black levels are incredibly dark and solid. This transfer is simply perfection, with no blemishes, scratches, or artifacts of any kind marring its exquisite beauty. This is the best this movie has ever looked hands down. 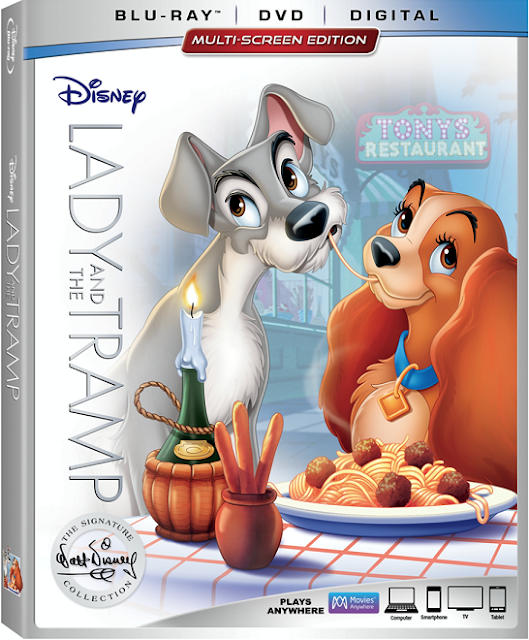 Lady and the Tramp offers two choices for your listening pleasure: a DTS-HD Master Audio 7.1 surround track and a DTS-HD Master Audio 3.0 mix that’s meant to hew as closely as possible to the original mix. Both sound great but for me personally, I liked the DTS-HD Master Audio 7.1 mix best because it felt the most immersive. Dialogue (and barks) are clear and intelligible with none of the hissing or other age-related issues that can pop up in these older films. This is primarily a front channel mix with the rear channels handling the musical score and some ambient noises. The many wonderful musical numbers sound fantastic and will have you tapping your foot immediately. Fans of the movie’s soundtrack will be very pleased with this fine mix. This is another jam-packed Blu-ray that deserves its Walt Disney Signature Collection moniker! There’s hours of extras for you to wade through and all of them are in high definition with the exception of the extras from earlier releases that have also been provided. Walt & His Dogs - We hear Walt Disney recollect all of the dogs he has had in his life and how much he loves them. We also get to see a cute cocker spaniel explore the Walt Disney Museum which offers images and video of Disney's life and career. Stories From Walt's Office - A look at Walt Disney's restored office as it was when he died. Actually there are two offices shown - one his working one that was a lot messier and one for meetings and such. He even had a hidden kitchen built in! How to Make a Meatball and Other Fun Facts About Lady and the Tramp - Alexys Gabrielle and Teen Chef Amber Kelley share cooking lessons and some trivia from the movie. Song Selection - Here's five different songs that you can sing along with if you are so inclined. They include: "Peace on Earth," "What is a Baby/La La Lu," "The Siamese Cat Song," "Bella Notte," and "He's a Tramp." Sing-Along Mode - This is pretty much the same things as the previous extra but it's done along with the movie. Classic Bonus Preview - A look at the classic bonus features from the earlier releases that are now available to watch digitally. The following supplements (with the exception of "Disc Introduction by Diane Disney Miller" and the "Second Screen version of “Inside Walt’s Story Meetings,") have been carried over from the Diamond Edition. Inside Walt’s Story Meetings: Audio Commentary – If you‘d like to hear Walt talk about the movie thanks to a collection of recordings combined together (and who wouldn’t? ), then you should make sure that you listen to this commentary. You can’t find this in the bonus features section like you’d think, but instead after selecting “play movie” where you can turn on the excellent commentary. Diane Disney Miller: Remembering Dad – A nice but brief look at Walt Disney as remembered by his daughter. A lot of this information is already widely known, but it was still nice to hear it again. Deleted Scenes – We are given three deleted scenes in storyboard format. They’re ‘Introduction of Boris’, ‘Waiting for Baby’, and ‘Dog Show’. Music & More – We get a bonus song that wasn’t recorded titled ”I’m Free as the Breeze,” by Ray Gilbert and Eliot Daniel. Lady and the Tramp is one of Walt Disney’s enduring classics that has never looked or sounded better than this Blu-ray. This new Signature Collection release offers a fantastic video and audio presentation and as if that wasn’t enough, it’s has hours of extras that are interesting and informative which makes this a must buy for fans!